BRACEBRIDGE — Muskoka’s challenged transportation initiative got a big boost from the province Friday. The District of Muskoka operates The Corridor 11 Bus, a small bus van that runs on Hwy. 11 Monday to Friday from Huntsville to Barrie and back, making stops along the way in: Port Sydney, Bracebridge, Gravenhurst, Washago, Orillia and Barrie. MPP Norm Miller announced the Ontario government is helping 40 communities across the province improve transportation services within and between communities to make it easier for people to get around. He said the District of Muskoka will receive $699,786 of support through the Community Transportation Grant Program. The money is not exactly new, municipalities regularly received money as part of your gas taxes you pay at the pump. But it will help the district’s Corridor 11 bus. It’s a small bus van that runs on Hwy. 11 Monday to Friday from Huntsville to Barrie and back, making stops along the way in Port Sydney, Bracebridge, Gravenhurst, Washago, Orillia and Barrie. 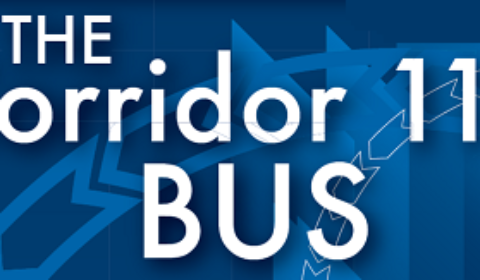 Previously the district brieflyran a rural bus service (Muskoka Extended Transit) to smaller communities, which failed to attract much ridership, much like the Corridor 11 route. This money could help that. Miller adds: “This investment will improve the quality of life for many people in our communities that are currently underserved by transit.